I cheated and asked the butcher to slice the pork loin for me as his knives are so much sharper than mine (well, he is my son!!). I was a little unsure as to this recipe and whether the pork would be cooked within the four hours but the aroma in the kitchen whilst it was bubbling away soon cleared up any doubt about this dish. Pork and apples – what a wonderful combination. As I was short on time, I served the roast up with white bean mash and baby carrots; a superb dish. There was ample pork left over for the next day which was delicious cold served up with cashew pesto courgetti (recipe to follow). With a sharp knife make horizontal slices through the pork loin, about 1” apart taking care to only cut about three-quarters of the way through. Stuff the apple slices into the slits in the pork loin ensuring that they are pushed well down. Scatter the sliced onions over the joint and top with a good drizzle of honey, the ground cinnamon and the salt. Cover and cook for about 4 hours on a low heat. Remove from the cooker and rest for a few minutes before carving into delicious, moist slices. I served my pork up with White Bean Mash and baby carrots but it could be served with almost anything. It was really delicious served cold the following day – succulent and moist, and I paired it with courgetti tossed in cashew pesto. 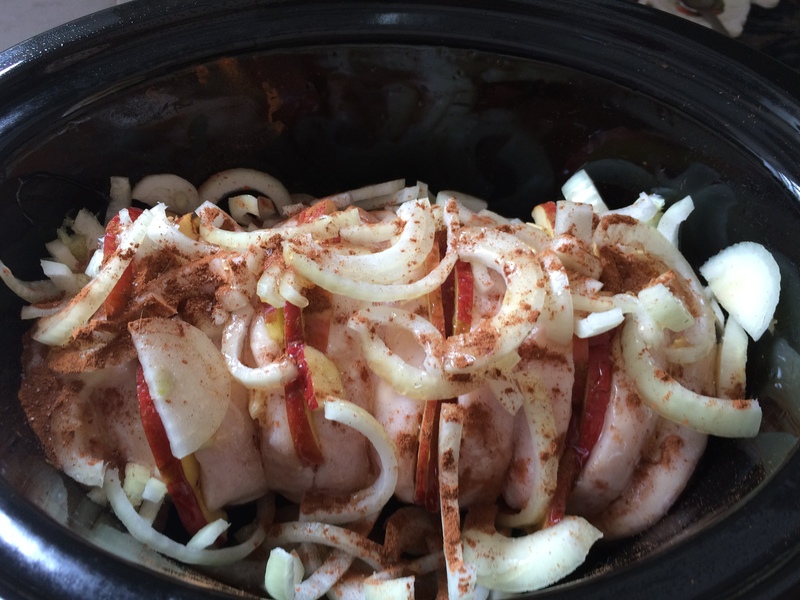 This entry was posted in Dinner and tagged Apples, Dinner, Gluten Free, Healthy Eating, Onions, Pork, Slow Cooker. Bookmark the permalink.